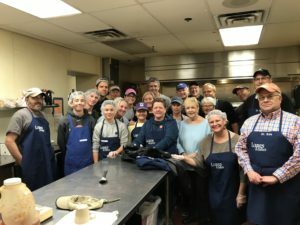 An independent program that serves an evening meal five days a week in many locations throughout the Twin Cities area, meals are purchased, prepared and served by volunteer teams. Volunteers from St. Edward’s have been serving no-charge, no-obligation meals to the hungry of our community for more than 30 years at the St. Stephen’s Church in Minneapolis and the Creekside Senior Center in Bloomington. Site coordinators purchase the food and have it delivered to the serving site. On serving days, there is a team of St. Edward’s volunteers who prepare the meal and another team that serves the meal. Some volunteers serve every month, some serve every other month, and some are on our sub list to call if we need them. Please contact our site coordinators to volunteer your time. 1. St. Stephen’s Site: Volunteers are needed starting at 3:00pm for food prep, and from 5:00-7:00pm for serving the meal.If you would like to volunteer, contact the parish office at 952-835-7101. All adult volunteers are required to complete VIRTUS training and a background check. Volunteers can connect with a car pool to the serving site or provide their own transportation.